Vanessa goes home from the rehearsal in the kind of abject misery that only a tweener knows, having found out to her shame that she wasn’t the best young singer in the contest. In order to help her shake off this disappointing experience, Mrs. Taybeck suggests Vanessa spend her Saturday at the Plaza with her cousins. I mean, that’s what I would do. 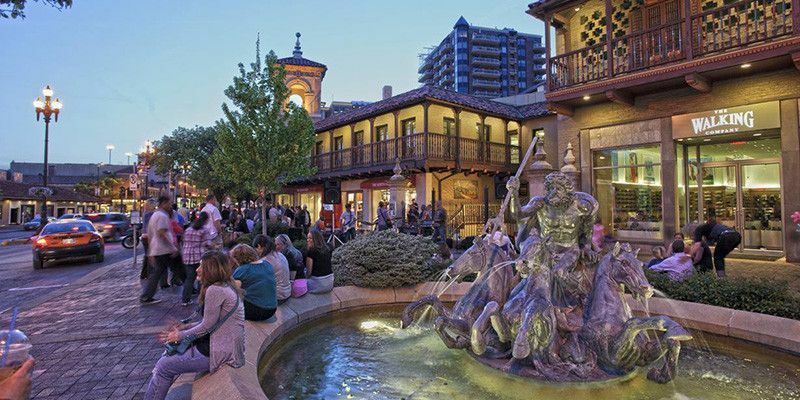 I haven’t lived in the Kansas City area since 2010, but when I was there, the Plaza was always the destination to take the edge off a bad day or make a good day better. 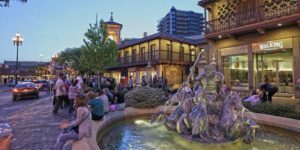 Officially, it’s the Country Club Plaza, but everyone just calls it the Plaza — blocks and blocks of interesting shops, good eateries, Mediterranean architecture, whimsical statues and lots of fountains. I usually shopped a little — mostly just hitting the cheese shop and Three Dog Bakery — and then went straight to the coffeeshop in the multi-story Barnes & Noble. So of course, that’s where Vanessa’s scheming cousins are looking to dump her. But it doesn’t work out that way. After the roller-coaster that Vanessa has been on since she made the bet, she’s in an introspective place that’s very unusual for her. There has been so much that has happened, and all of it happened so fast. She has two different tracks that are competing for her attention. First, there is her church life — the Club, James’ crisis of faith, the whole startling thing with Mary. And then, for a short time, there was suddenly this possibility that opened up — a whole different dream, and one that was close to her heart. Maybe she could be a singer. Maybe that would even be the miracle that she was called to. But in the space of a few hours, it all comes tumbling down. She wasn’t as good as the other singers there — not even close. So what’s left? What should she do now? Feeling that for once, she doesn’t want distraction and chatter, Vanessa lets her cousins go on without her, so she can just sit still for a while. Well, you’ve done it now, Vanessa thought. You’re out here with no one to talk to and you’re going to get bored to death in five minutes. But she wasn’t bored in five minutes, or even ten. The fountain kept up its plunking and babbling behind her, and she caught snatches of conversation from passing shoppers. Just next to the toy store was a spot where tourists could take rides in horse-drawn carriages, and the rhythmic clip-clop of great, plodding hooves on the pavement added to the background noise. Vanessa settles into her thoughts, lets them roam. They wander to the parable of the Paralytic, which she hardly attended to when she heard it in church. But now, sitting by the fountain, being in a place where she is past her own flood of thoughts and emotions, she is in that quiet place where you just … wait. I feel as though that, more or less, is the place I have been when you experience those moments of visitation. It can be a thought, a word from a stranger, an unexpected encounter, an idea out of the blue. Just a moment when my defenses were down and the wall of noise that separates me from God was at its thinnest and most vulnerable. Sometimes, the oddest things come to you at times like that. But doesn’t it seem like where Vanessa would have to be before she would be ready to see Mary again? Because in a way, she was looking for her, even though she didn’t admit it consciously. Looking over to her left, Vanessa saw that one carriage had filled up and the driver urged the horse forward with a flap of the reins. 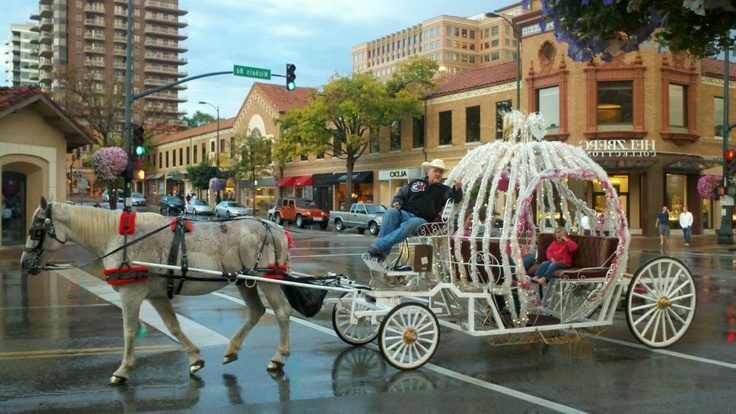 The carriage behind that one was just waiting to see who would want a ride. 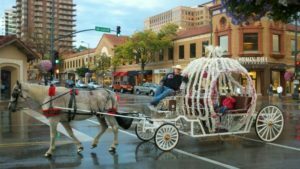 The driver was standing to one side scrolling through things on his smart phone, while the gray, dappled horse stood patiently in front, harnessed to the carriage with its great head drooping slightly. standing near the horse, leaning close to sing in its ear. There are other ways that miracles can begin. But that’s the one that occurred to me.